A beautiful piece of craftsmanship in Leopard print Jasper with Croco leather. Rock Bands are unique pieces that personify individuality. Each wristband is hand made using the finest quality aged leather and fixtures. Each stone is hand carved and polished. The stones used are beautiful to the eye and beneficial to the mind and body. Each Rock Band is one-of-a-kind, and because of this, stone colors and patterns will vary. 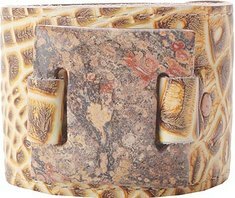 Features a large yellow crocodile skin band with a square shaped leopard skin Jasper stone. Jasper is the “Nurturing Stone”: Creates Gentle Relaxation and enhances Healing.